Our FREE Charitable Donation Receipt can be used to itemize your donations for tax deduction purposes. The spreadsheet will automatically calculate the value of the most commonly donated items. A low, average, or high value can be selected per item. Values are based on national averages from Salvation Army, Goodwill, and other charitable organizations. 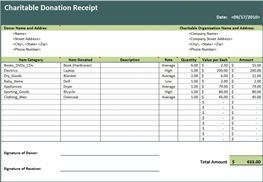 Our Charitable Donation Spreadsheet offers signature lines and can be printed as a receipt. It can also be used in its electronic format as a log or calculator for donation tracking purposes. This spreadsheet makes donating a breeze!